The range of Beltran solutions continues to expand in response to the emergence of new technologies, entire new industries, more stringent regulatory demands and changing client needs. Heightened public and private awareness of serious global energy and environmental challenges also energizes our work. in-depth practical and theoretical experience, and our ongoing commitment to the research-development- demonstration-deployment (RDD&D) cycle. This process is reinforced by the dedication and skill of our engineers, scientists, industrial designers and support staffs. 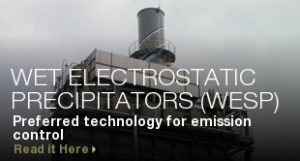 Our Wet Electrostatic Precipitators represent the leading edge of gas cleaning and air-pollution control technology. They feature Beltran’s proprietary, multistage ionizing rods, with star-shaped discharge points in a square or hexagonal configuration. This unique geometry generates a corona field 4-5 times greater than standard wet or dry ESPs, which induces a continuous negative charge in submicron-size gas stream particles, propelling them toward a grounded collection surface, where they are washed away by sprays of recyclable water. Beltran’s multistage, tubular configuration surpasses scrubbers, bag houses, and other designs in effectiveness in controlling submicron-range particulates, acid mists, and condensed organics. It is also the ideal solution for heavy, tar-infused exhaust streams. Modular and adaptable to a variety of present and future pollution control requirements, Beltran Poly-Stage Precipitators remove submicron smoke particles down to PM 0.01 with superb efficiency and extremely low operating cost. The systems use electrostatic enhancement of particles, resulting in minimal pressure drops and low energy input loads. The light, compact units are easily mounted on roofs or within existing exhaust systems, with liquid fractions reclaimed via sumps. Modules are custom-engineered for each individual installation. 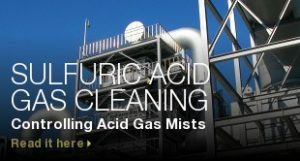 Beltran Fume Coalescers are a versatile, economical means of capturing ultrafine mists, VOCs, oily aerosols, acid gases (SO2, HCl) and other liquid, viscous or soluble solid particles down to PM 02.5 or smaller. The light-scattering effect of these ultrafine particles causes them to create an inordinate amount of visible pollution and haze, even at relatively low concentrations. They may also accelerate corrosion of sensitive downstream equipment, and compromise safety and product purity. These emissions may be released at several points in various industrial and chemical operations such as petrochemicals, asphalt, chlorine and acid plants, textiles, biological, metallurgical, and other industries. Beltran’s solution is a custom-configured array of tubular “candles” containing cylindrical beds of glass fibers whose fineness is precisely gauged to the composition and characteristics of each gas stream, resulting in optimum efficiency. The chemical resistance and other properties of the fibers, the supporting mesh screens and the housings are also tailored to each application. 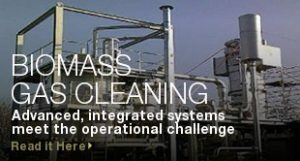 Beltran coalescers operate at 99.5% collection efficiency, while eliminating the heavy energy inputs required by conventional scrubbers and other mechanical collectors. In practice, large mist particles impinge directly on the fibers and coalesce. Finer particles, which may actually be small enough to escape through the interstices of the fiber beds, exhibit a higher degree of diffuse, multidirectional Brownian motion, allowing them to be trapped by the fibers as well. The collected mist particles coalesce into a liquid film, which passes through to the inner annular space and is drained out through the bottom. Reverse-flow coalescers are also available from Beltran. The Beltran Biomass Cogeneration System is a closely integrated, three-stage process that converts biomass and other organic wastes into powerful, clean-burning synthesis gas that can be used to generate energy as combined heat and power (CHP), or to produce hydrogen, biofuels and valuable industrial chemicals. Beltran has combined innovative enhancements to legacy technologies to create a solution for efficient waste management, alternative energy generation and pollution control, including greenhouse gas emissions. Gasification of plant-based biomass closes the carbon-cycle loop, offering the potential for carbon-neutral alternative energy generation. • A gasification reactor, which produces energy-rich synthesis gas (syngas) from plant or animal-based biomass or other carbonaceous material. • A wet electrostatic precipitator to clean and condition the syngas, essential for downstream uses. • An internal combustion engine producing combined heat and electric power (CHP), which can be used for plant operations, local power supply, and local and district heating. The system can also be adapted to Integrated Gasification Combined Cycle (IGCC) applications.